The Trafalgar Square Christmas tree is a tree donated from the city Oslo of Norway to London, as a symbol of gratitude and support from the British people during the second world war. 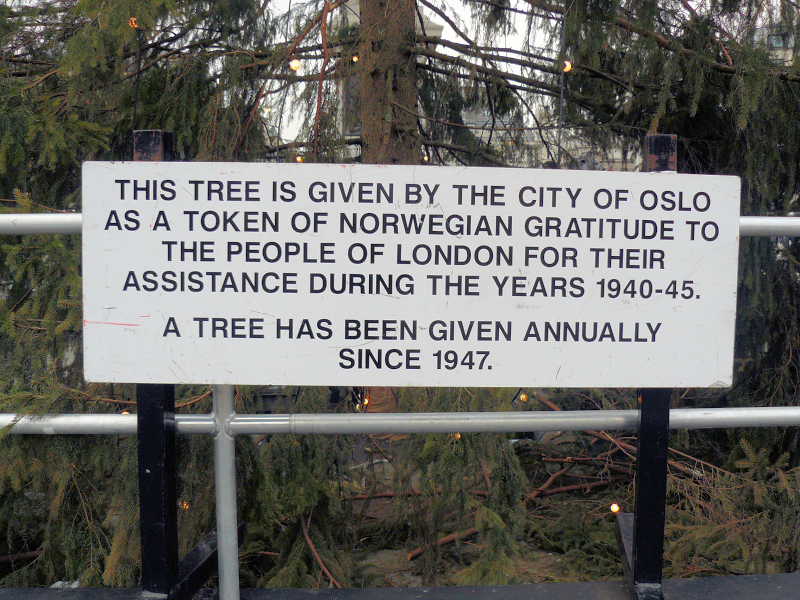 The tree is sent every year since 1947. Twelfth night after Christmas the tree became recycled and composed. 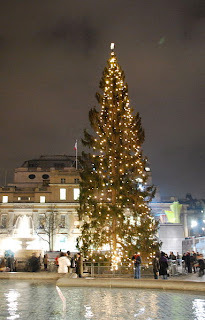 The tree lighting ceremony in Trafalgar Square takes place on the first Thursday in December and is attended by thousands of people. The ceremony, led by the Lord Mayor of Westminster, includes a band and choir followed by the lighting of the tree with the flick of a switch. This is a link to a page of BBC. Here you can find a lot of stories from soldiers and civilians. This is a link to the story i read. The story in the link above is about two British RAF pilots who take part in the bombing of Porsgrunn harbour. Their plane is shot down and they crash into a lake. They are saved by two Norwegian Farmers who take care of them. Later the Germans find them and kill the Norwegians before the pilots are taken to prison. This operation was preformed in April 1945. Not long after the pilots where arrested the war ended and they were set free. 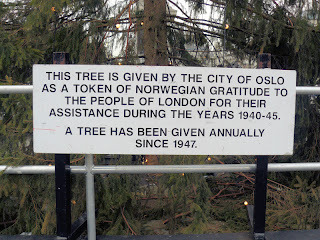 Like how you showed the text about why this tree is given by the Norwegian people. The story you read was interesting as well. Those Norwegian sacrificed there lives for those to British RAF pilots. Hey my nam's Sam and I'm a senior in high school in the U.S. Here's a link to my blog post about Japanese Internment camps! Thank you for comment my blog. I would gladly take a look at your blog. It sure is an interesting piece to read. It helped that there were pictures paper writing services and facts given so it's not just interesting but also informative. Thanks for sharing this by the way.